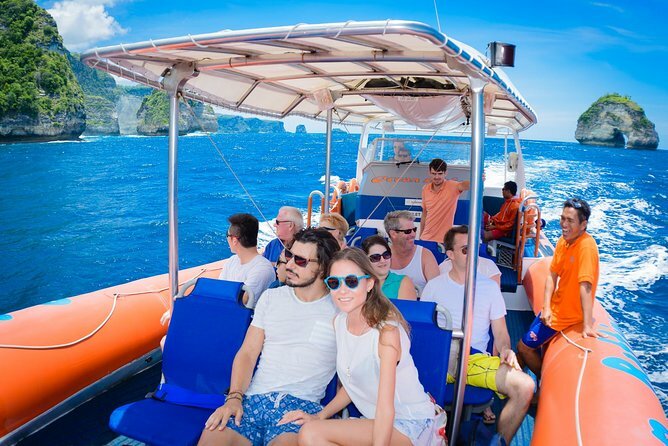 Experience Bali's fastest and most exciting full day snorkeling cruise as you discover the magnificent sights of Bali's three sister islands, Nusa Lembongan, Nusa Penida and Nusa Ceningan. Sit down, hang on, and let's go!! Tour is limited to a maximum of 5 travelers. The boat departs at 10:30am from Bali and arrives at 5:30pm back in Bali. Hotel pickup times vary depending on your hotel location. Pickup times will be stated on your booking ticket. Ocean Rafting is not suitable for children under the age of 10, pregnant women or people with back or heart problems. South Bali (from Denpasar to Ubud, Canggu to Gianyar). Pick up and drop off were on time. Service on the boat was nice but the boat itself wasn’t appealing. I was hoping to lay out relax on the boat, couldn’t bc it was a speed boat where you are strapped into a seat and can be a very rocky ride, not smooth and relaxing as I was envisioning. The snorkel spots had many dying corals and saw a lot of trash in the waters. Wouldn’t recommend.